Morning mist falls in the Children's Garden at St. Thomas Aquinas Catholic School before the May Crowning of the Blessed Virgin Mary in Dallas on Sunday, May 10, 2009. The crowning event was moved indoors due to potential rain. 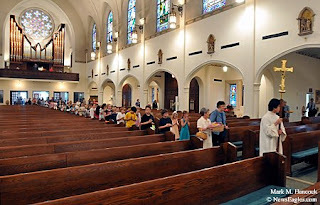 A procession enters St. Thomas Aquinas Catholic Church during the May Crowning of the Blessed Virgin Mary. Fr. Vic Bartolotta (right) leads a period of reflection during the May Crowning of the Blessed Virgin Mary. Fr. 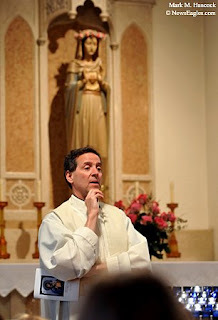 Vic Bartolotta leads a period of reflection during the May Crowning of the Blessed Virgin Mary. 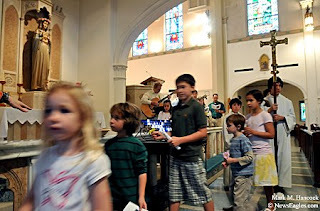 Children present flowers during the May Crowning of the Blessed Virgin Mary at St. Thomas Aquinas. 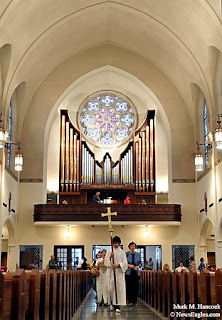 Congregants present flowers during the May Crowning of the Blessed Virgin Mary at St. Thomas Aquinas in Dallas. 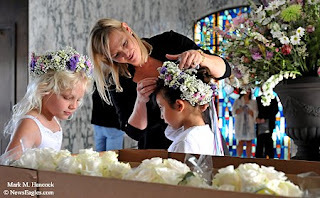 Rose Allegro (top) pins flowers in the hair of Ariana Ramirez (right) while Mary Cristina Allegro (left) examines flowers before a Coronation of Mary mass at St. Monica Church and School in Dallas on Friday, May 8, 2009. 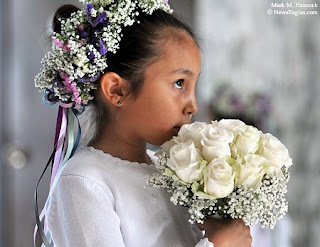 Second-grader Ariana Ramirez smells her roses before a Coronation of Mary mass at St. Monica Church and School. 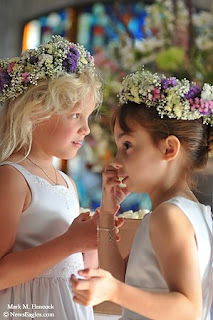 Mary Cristina Allegro (left) and Sofie Callaway (right), both 2nd graders, prepare before a Coronation of Mary mass at St. Monica. 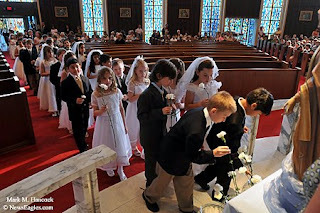 Second-grade Communicants present carnations during a Coronation of Mary mass at St. Monica. 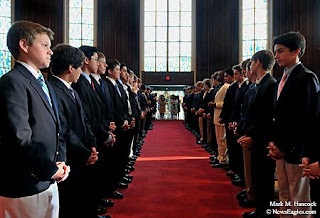 Eighth-grade Confirmati boys form an honor guard during a Coronation of Mary mass at St. Monica. 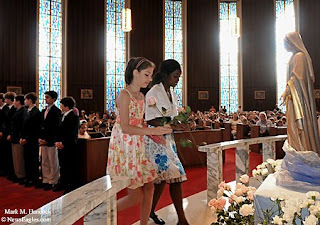 Eighth-grade Confirmati girls present flowers during a Coronation of Mary mass at St. Monica. 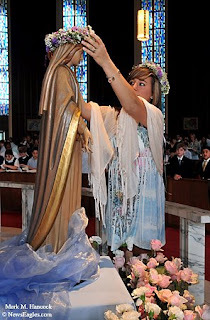 Analiese Florkowski crowns Mary during a Coronation of Mary mass at St. Monica. 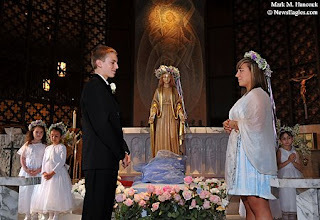 Confirmati Tanner Davis (left) and Analiese Florkowski (right) face each other during a Coronation of Mary mass at St. Monica Church and School in Dallas. 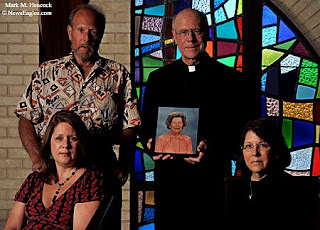 Siblings (clockwise from top left) Phil Pichard, Monsignor Larry Pichard, Denise Snider and Annette Foster pose for a portrait with a photo of their late mother Mary Condel Pichard at St. Pius X Catholic Church in Dallas before a Rosary mass on Sunday, April 19, 2009. 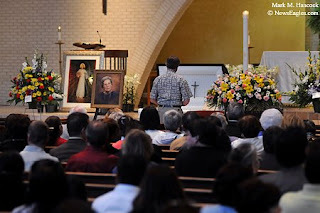 Photos celebrate the life of Mary Condel Pichard at St. Pius X Catholic Church in Dallas. 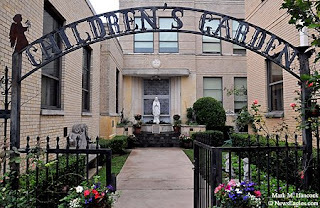 Mary Condel Pichard was part of the founding families of St. Pius X Catholic Church and actively supported the church throughout her adult life. 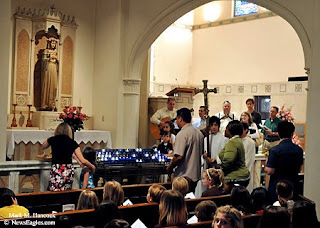 Attendees celebrate the life of Mary Pichard during a Rosary service at St. Pius X Catholic Church. 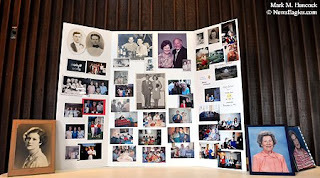 Mary Condel Pichard was born on Feb. 28, 1917 and died on Thursday, April 16, 2009. 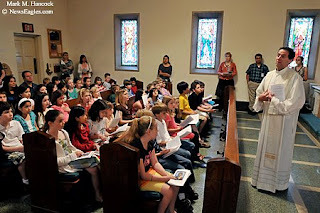 Attendees celebrate the life of Mary Pichard during a Rosary service at St. Pius X Catholic Church. 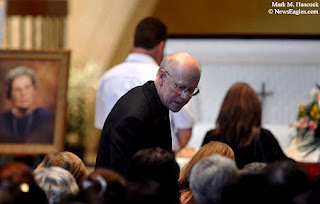 Monsignor Larry Pichard joins family members during a Rosary service for their late mother Mary Pichard at St. Pius X Catholic Church. 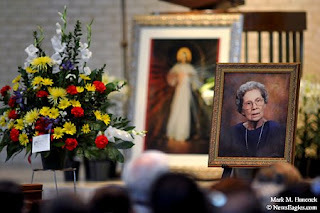 A portrait of Mary Condel Pichard oversees a Rosary service at St. Pius X Catholic Church. 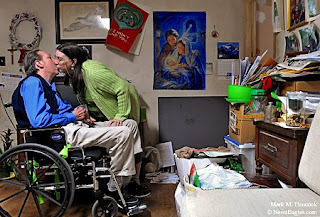 Angie Heiter kisses her husband Michael Heiter at their home in Richardson on Saturday, April 4, 2009. Michael Heiter had great jobs in engineering fields until a series of medical operations and finally a layoff. Now, the family struggles to pay basic bills. Matthew Ortiz, 2, (from left to right) is lifted by his mother Cynthia (Heiter) Ortiz while her other son Alex, 5, plays with a ball next to family friend Diane Gordon at their home in Richardson. 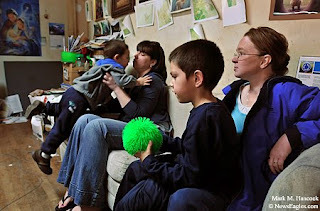 Angie Heiter and her husband Michael Heiter listen to their children at their home. 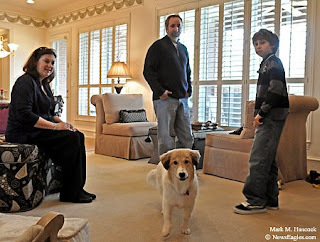 The family is one of six Dallas-area winners of the Extreme Makeover's American Dream Edition. 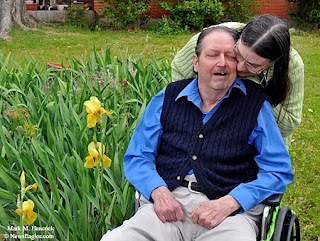 Angie Heiter gets food for her husband Michael Heiter at their home. Angie Heiter will receive $5,000 from Extreme Makeover and another $5,000 will be donated to a charity of her choice. 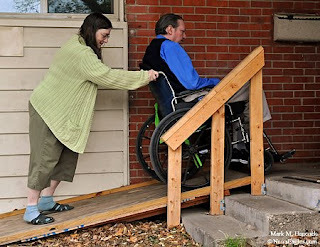 Angie Heiter slides down a wooden ramp with her husband Michael Heiter at their home. 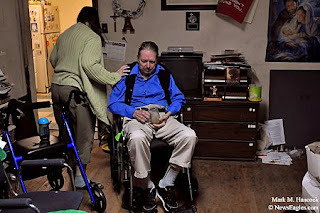 The family's home has deteriorated since Michael started battling cancer. Angie Heiter kisses her husband Michael Heiter at their home in Richardson. 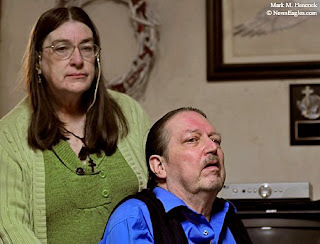 Michael Heiter died on May 5, 2009. Guests are invited to leave condolences and make memorial contributions. The ball drops between Sao Paulo FC's Paulo Dos Santos (No. 15) and Vancouver Whitecaps' Gagandeep Dosanjh (No. 10) as Bruno Bortolanca (No. 4, left) and Dever Orgill (No. 11, right) move in to assist during the Super Group Championship of the Dallas Cup Soccer Tournament at Pizza Hut Park in Frisco on Sunday, April 12, 2009. Sao Paulo FC's Everson Pires (No. 1) hits the ground after saving a goal attempt by the Vancouver Whitecaps during the Super Group Championship of the Dallas Cup Soccer Tournament at Pizza Hut Park. The tournament invites participating under-18 elite teams from around the world. Vancouver Whitecaps' Dever Orgill (No. 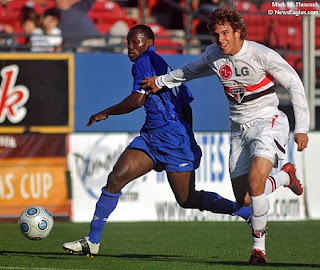 11, left) kicks the ball as Sao Paulo FC's Bruno Bortolanca (No. 4, right) defends during the Super Group Championship of the annual Dallas Cup Soccer Tournament. Sao Paulo FC's Maykon Silva (No. 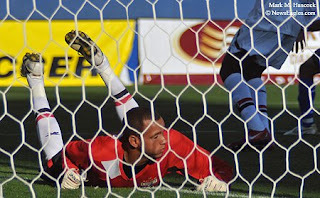 2, left) trips Vancouver Whitecaps' Russell Teibert (No. 12, right) during the Super Group Championship of the Dallas Cup Soccer Tournament at Pizza Hut Park in Frisco. Plano's Vonnie Martin (No. 25, bottom) slides safely into 2nd base as Plano West's Valerie Johnson (No. 3, top) recovers the ball during a high school softball game at Plano Senior High School in Plano on Friday, April 3, 2009. 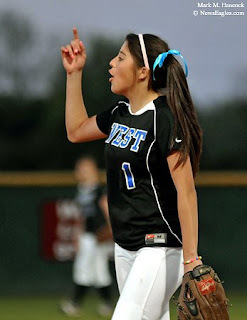 Plano West's Magean De La Torre celebrates an out during a high school softball game at Plano Senior High School. 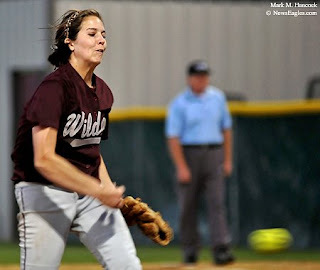 Plano's Abbi Frakes pitches during a high school softball game against Plano West at Plano Senior High School. Plano West's Christina Roosmalen (No. 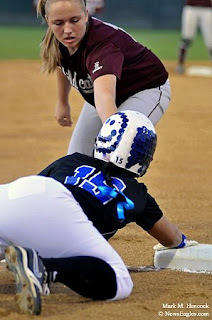 15, bottom) successfully steals 3rd base as Plano's Kat Batey (No. 14, top) tries to get a tag during a high school softball game at Plano Senior High School in Plano on Friday, April 3, 2009. 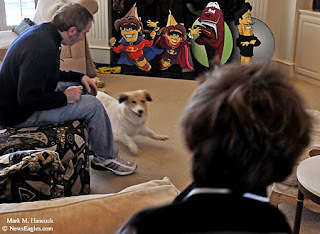 Bruce Yablonsky (center), Cindy Ray (left), their son Ryan Yablonsky, 10, (right) and Rupert, a 9-month-old puppy, (bottom) play at their home in Plano on Saturday, March 28, 2009. Ray created a new series of illustrated books that allow children to write and re-write stories about the books' subjects. Bruce Yablonsky (left) and his son Ryan Yablonsky, 10, (right) play with Rupert, a 9-month-old puppy, at their home. The first book, "The Stapler Caper: You Write The Story," was inspired by Ryan. The book's characters are displayed by the fireplace. 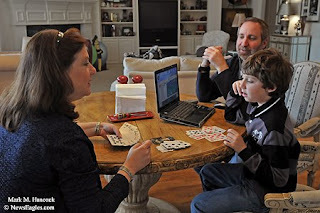 Bruce Yablonsky (right) and Cindy Ray (center) play cards while their son Ryan Yablonsky, 10, (left) wins a video game at their home. Cindy Ray (left) shows her cards to Bruce Yablonsky (right) and their son Ryan Yablonsky, 10, (center) after a game of gin at their home in Plano. Please read, "Plano mom Cindy Ray gets kids to write 'The Stapler Caper'" by Kathleen Green. Marco Polo Rangel and John Michael Szatkowski are vested as deacons during The Celebration of the Eucharist and The Rite of Ordination to the Diaconate at the Cathedral Shrine of the Blessed Virgin Mary of Guadalupe in Dallas on Saturday, April 25, 2009. 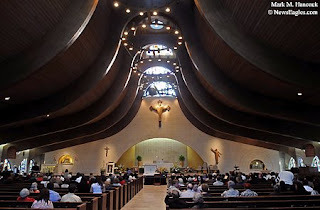 People named in this slideshow include: Arthur Unachukwu, Marco Polo Rangel, John Michael Szatkowski and Bishop Brian Farrell.